What is a Certified Wildlife Habitat? and…a Challenge for Zilker! As a National Wildlife Foundation Habitat Steward, my volunteer training is aimed at increasing awareness of creating wildlife habitats – this could happen in your yard, on a balcony, at a school, at a fire station, at a neighborhood grocery store. A wildlife habitat sounds kind of scary and maybe difficult. I mean, think of the wild places you’ve been like Yosemite National Park, Yellowstone, or Big Bend – they are vast. But the size is not important. What is important are 5 key features that must be in place to ensure you are supporting wildlife – and these features are not that difficult to establish. Provide food. Native shrubs, trees, and flowers provide nectar, berries, seeds, and nuts for wildlife. You could do supplementary feeding with bird feeders or nectar sources like a hummingbird feeder (though these are not necessary and require more expense and maintenance). Supply water. Wildlife need water, too! This is especially important here in Texas where it’s quite hot. Water can be supplied in a birdbath (refilled), in ponds, puddles, or rain gardens. It doesn’t need to be fancy – a big bowl of water in the garden works. Create cover. Animals need places to sleep, hide, and have protection from predators. Again, native shrubs, trees, and even piles of brush or a tree stump or dead tree provide cover. Provide a place to raise young. The cover in #3 often work for some animals to raise young. But you can also think about providing bushes where birds raise their young, or where butterflies and moths lay eggs, or supplying bird houses or bat houses. Garden sustainably. Reduce chemical use, increase composting, use lots of mulch, installing rain gardens to funnel rain to seep into planting areas rather than go into the gutter. To certify your habitat, you complete a simple online form. Normally, it costs $20 (plus a little more if you want a yard sign), but the City of Austin has free pre-paid forms you can use, saving you the $20. Remember, it does not need to be a yard – it could even be a condo’s front porch or apartment balcony! You can even certify your property with a Pre-Paid NWF habitat certification application courtesy of the City of Austin. Email wildlife@ci.austin.tx.us for an application today. Please include your mailing address and phone number in your request. I am in the process of working on my own yard in order to certify it as a NWF habitat (you’ll see more of my progress on that on the blog). Would you certify your yard, too? I can help give you advice and educate you on the process – feel free to email me (Joan) at zilkergardens @ gmail.com. 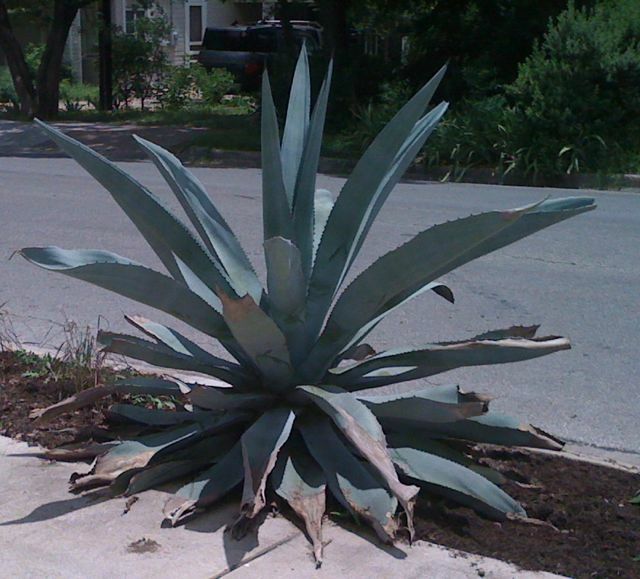 I would like to start the Neighborhood Habitat Challenge for Zilker in 2011 … how many habitats can we certify? Are you in? Look at the winners from past years in Austin. Last year, Bouldin Creek certified 14 habitats! I know Zilker can do more than that in 2011. I noticed in the Austin Energy tree list that I posted yesterday, one of the elements of the description of the trees include whether they are deciduous or evergreen. Individuals new to gardening might be unfamiliar with the term “deciduous,” so I thought I’d clear it up. Deciduous plants and trees lose their leaves in the winter. As an example, the Mexican Plum tree is deciduous. Evergreen plants and trees keep their leaves year-round. As an example, the Yaupon Holly is evergreen. We have a pretty short winter, so your deciduous plants and trees will lose their leaves around November and start growing them back in February and definitely by March! Of course, there are always exceptions to rules – or at least other categories. The Texas Live Oak is semi-evergreen. It is considered evergreen because it does have leaves year-round. If you have one, you’ll notice that in spring, it will lose all its leaves while new ones pop through. So you don’t actually see a bare tree at any time, but you definitely notice all the leaves on your property that you need to rake up and compost or send to green waste! Why is this an important distinction? When you do garden design and planning, you want to take into consideration what your garden will look like across the year. What colors of leaves, leaf coverage, flowers, height of plants etc. will exist at any certain moment during the year. Say you want to have coverage of something (like hide a neighbor’s bright security light), well the deciduous tree won’t be a good choice because in winter, that light will shine through because your tree will only have limbs. You also can plan to have deciduous and evergreen plants in groups, so that no area looks too bare in winter. I will be writing more in the near future about garden design. Stay tuned! 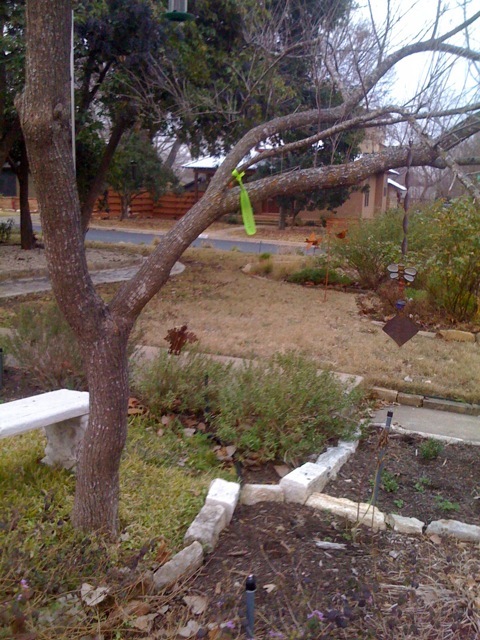 Have you noticed any green tags on your trees? 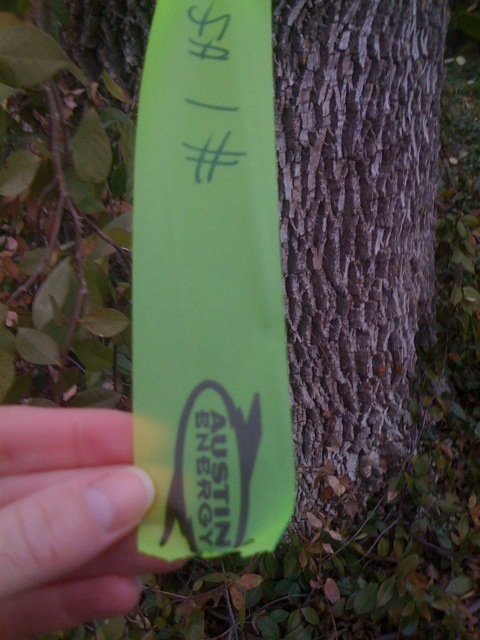 This past weekend, I have noticed many trees with green tags that are from Austin Energy. On the tag, there’s a note indicating the type of tree. As you might have guessed, all the trees are located under power lines. It looks like Austin Energy is starting their tree trimming in our neighborhood soon. If you would like more information or have questions, you should contact Austin Energy directly. I think you need to be proactive if you think something incorrect is occurring with your trees. On the Zilker neighborhood listserv, I have read posts from neighbors who were not satisfied with the Austin Energy’s contractors, aborists, and foresters. I do not have personal knowledge but do please be proactive, as our trees are our best assets, providing much needed shade (for humans) and shelter (for animals). On the other hand, it is true that trees need to be pruned to avoid damage to electrical infrastructure (which only costs taxpayer dollars to fix). The best solution is to: CONSIDER THE SIZE OF THE TREES YOU PLANT & THE LOCATION. If a power line exists overhead, don’t plant an oak tree which will become 50-100 feet high. In fact, Austin Energy has a wonderful list of preferred trees for planting under powerlines. You will notice by browsing the list that none of these trees get much higher than 20 feet tall. Some of my favorites on their list include: Orchid Tree, Mexican Plum, Evergreen Sumac, Texas Persimmon, Texas Redbud! But all of the trees listed are wonderful. You are not alone if you have a tall tree that needs to be pruned. You might have inherited it! I know we did. We have a non-native loquat tree growing under the power line extension from the pole to our house. This tree gets very tall. We are in a quandary right now, as we don’t really want to remove it, but we know it will become a problem in the future. At worst, we need to be prepared for its future pruning by Austin Energy! Recently on the neighborhood listserv, there’s been plenty of talk about the COYOTE who has taken up residence in our ‘hood. Some thoughtful and neighborly soul posted these signs around the ‘hood to warn people that their small pets could possibly be in danger. Coyotes are wildlife. And we have taken over the wild animal’s space through development. There was a suggestion that citizens, upon seeing the coyote, should call 311 and have the coyote picked up and relocated. This is not the best advice. Such a relocation of the animal would not occur. The head of town lake animal center’s wildlife section provided a lot if info during my National Wildlife Federation Habitat Steward training this past fall. Animal Protection Officers will not pick up healthy wild animals that have been trapped in private traps. If you bring a trapped, healthy wild animal to the shelter, it will not be relocated, but, in accordance with State Law, simply returned to the area where it was trapped. 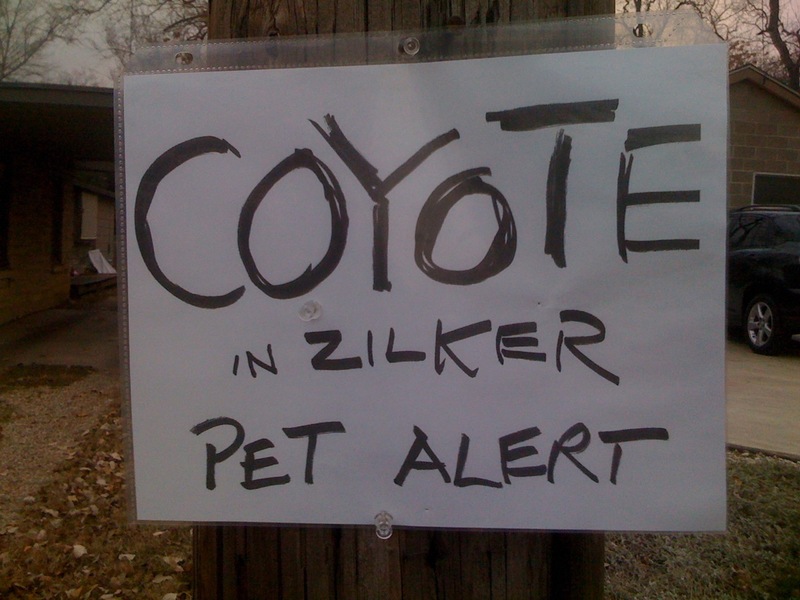 If you come upon coyotes near your house, you should yell at them, seem large, bang pots etc. in order to have the coyote associate humans with fear. Also, do not keep pet food outside. The point is to keep them afraid of humans so they do not start to equate humans with easy food. When wild animals do associate humans and houses with easy food, you’ll see your pets start getting eaten. Only at that excessive point would Townlake animal people become involved – and really that is a bummer situation for everyone involved. Humans and wildlife living together is a balancing act. You can do your part by not being friendly to wildlife. In fact, try to scare it away and do not leave pet food or other “food” easily accessible on porches or in backyards. If you are worried about your pets (especially small ones), accompany them outside on leash.